Criminal Bitcoin — How Deep is The Dark Side of the Most Widely Traded Cryptocurrency? BitcoinBitcoin is a digital currency (also called crypto-currency) ... More and blockchainA blockchain—the technology underlying bitcoin and other c... More technologies are sparking innovation in financial technology (FinTech), but they do have a dark side. Criminals can use bitcoin for illegal activities and attempt to hide their ill-gotten gains, hoping law enforcement will not track the funds through the bitcoin transaction chain. They also steal huge quantities of cryptocurrency—nearly US$1 billion, according to a recently released report by CipherTrace. And in both cases, they try to circumvent today’s growing cryptocurrencyA cryptocurrency (or crypto currency) is a digital asset des... More Anti-Money Laundering (AML) laws and convert these tainted blockchain funds into clean and spendable money. Nonetheless, until now there has been no definitive research or blockchain analysis into how extensively the most widely traded cryptocurrency is associated with illegal activity and money laundering. New research from CipherTrace recently uncovered proof that criminals not only use large amounts of bitcoin for their illicit activities, but they also send significant amounts of tainted bitcoin to exchanges—especially those in countries where cryptocurrency AML regulations are lax or lacking. In fact, analysis of the data reveals that the top exchanges have laundered US$2.5 billion worth of bitcoin at today’s prices. This research was detailed in the 2018 Q3 Cryptocurrency Anti-Money Laundering Report, which CipherTrace published on October 10, 2018. The report covers the methods and results of what is perhaps the most exhaustive investigation into criminal bitcoin ever conducted. Essentially, this CipherTrace study involved quantitative bitcoin blockchain analysis of all the bitcoin payment transactions on the 20 top cryptocurrency exchanges globally. 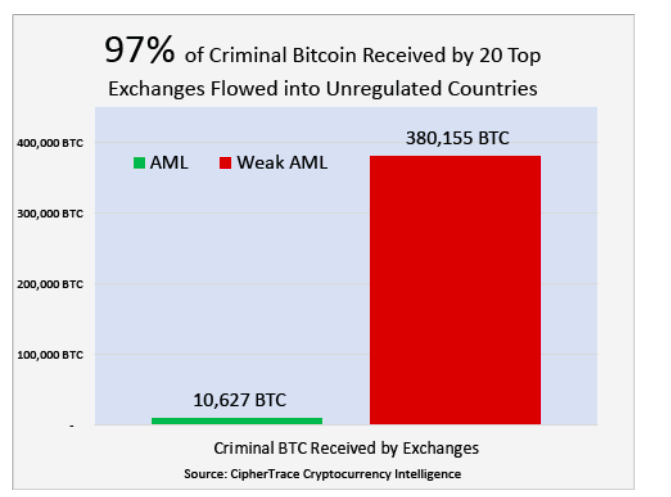 The results showed two things: 1) There is significant criminal use of bitcoin, and 2) cryptocurrency AML laws are working because 97% of direct bitcoin payment transactions from identifiable criminal sources were received by cryptocurrency exchanges in countries with weak crypto AML regulation. The analysis also identified 380,155 bitcoins that were received by cryptocurrency exchanges directly from criminal sources between January 9, 2009 and September 20, 2018 by tracking bitcoin payments across the blockchain. 36 times more criminal bitcoin was received by cryptocurrency exchanges in countries with weak crypto AML regimes. The research defined a direct payment as one that moves from an identified criminal actor or service into a cryptocurrency exchange. It also defined an indirect payment as one that moves through one or more cryptocurrency wallets or addresses before being deposited into an exchange for conversion into either fiat currency or another cryptocurrency. CipherTrace Cryptocurrency Intelligence was used to reveal these criminal associations by performing AML tracking and bitcoin forensics. This bitcoin blockchain analysis applies machine learning, and advanced analytics, clustering technologies, and an advanced bitcoin transaction API. 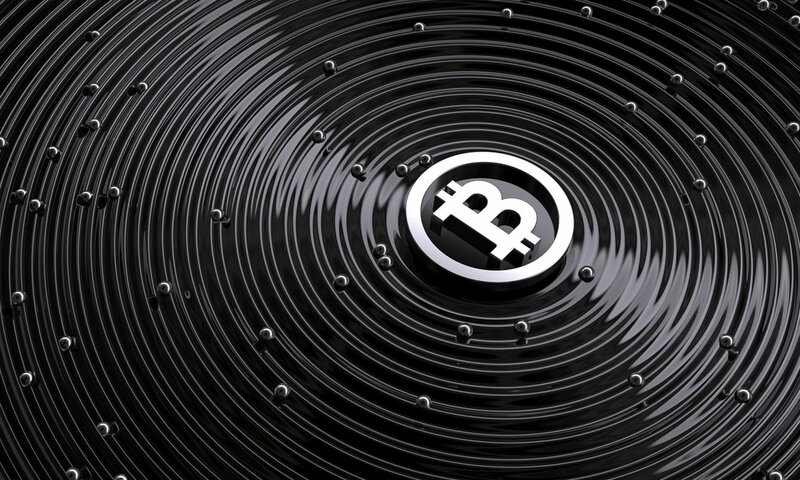 CipherTrace analysts further used cryptocurrency attribution data from active intelligence gathering, public and private intelligence sources, and open-source intelligence (OSINT) to reveal tainted bitcoin associations and ‘dirty’ touchpoints in the bitcoin chain—i.e., track bitcoin addresses to reveal associations. Essentially, the study shows that criminals are flowing large amounts of dirty bitcoin into these poorly regulated exchanges and other services—such as mixers—turning it into “clean” cryptocurrencies. Then, they can move the funds into the global financial payments system with little risk of being detected. However, for governments and regulators around the globe, the positive impact of well-enforced AML cryptocurrency laws revealed by this study should come as welcome news. First, it has the obvious benefit of reducing illegal and illicit activity in general. Secondly, criminals use these laundered funds to finance illicit activity—such as international drug gangs that use “clean” funds to produce and distribute more illegal substances. This direct correlation between cryptocurrency AML enforcement and criminal activity is also important information for governments around the globe that are trying to nurture their crypto economies. By making cryptocurrency use in their jurisdictions secure and untarnished by criminal activity, they can create a trustworthy virtual currency financial market to attract equally trustworthy digital asset business (DABs). The report also covers cryptocurrency AML regulation activity around the globe, and notes several jurisdictions, such as the aspiring blockchain islands of Malta and Bermuda, that are actively following this AML cryptocurrency path. Others, like the US, are working more forcefully to not only reduce money laundering but also protect consumers from fraud and criminal activities through tougher enforcement of crypto AML laws. One example is US FinCEN, which has, among other recent signaled that it is putting renewed scrutiny on crypto-to-crypto services such as mixers. The agency has also set out clear guidelines for exchanges and other DABs and recruited the IRS to help audit “all” cryptocurrency exchanges. 97% of direct criminal bitcoin payments are sent to unregulated exchanges. 36 times more criminal bitcoin is received by cryptocurrency exchanges in countries where crypto AML is either weak or not enforced. Cryptocurrency money laundering on top exchanges involves a significant amount of bitcoin—some 380,000 bitcoins or $2.5 billion at today’s prices. In the first three quarters of 2018, $927 million of cryptocurrency was stolen by hackers; since the Q2 report, CipherTrace have recorded new reports of $166 million. Bank Secrecy Act (BSA) rules. It also enlisted the IRS to examine 100% of cryptocurrency MSB transmitters for BSA compliance.